Akita dog's kennel what almsot veteran owners own in Japan is the type of grate with opening and closing door. We can't find such the kennel at home centers and other shops easily. So it is the general way that we order to custom it to an iron factory. But it doesn't mean that all iron factories are befitting to make Akita dog's kennel. It is preferable that the manufacturer is the maker who understands Akita dog's characteristic to some extent. We find sometimes Akita dog's wooden kennel what made by a carpenter or made by himself or herself. But Some Akita dogs would like to bite the wood. So we recommend the Akita dog's kennel was made by iron. How do you think what is the best size for an Akita dog's kennel? It is enough size the depth and height are each 1m 20cm, the width is 1m 50cm. You don't need to spread blindly. If Akita dog's kennel is the every direction grid type, there is the merit for good ventilation. But not a few kennels were equiped in the half the room for example narwhal of hut or house. One of veteran owners points out about it," The condition of half the room doesn't preferable. The reason why it is poor ventilation in the summer. And it is not also good from the point of view the health and hair blowing". Akita dog's birthplace is the region with heavy snowfalls. So Akita dog resistant to cold. But we almost do covering the four-way of the kennel for resistant to cold in the winter. And we pave the straw for the warmth and hygiene. By the way, we'd like to explain you concern grown up over 5 months Akita dog.It is the assumption that you have wide space on site of your house. How do you think which is better an Akita dog spends wide space of outside in the day time or continues to spend in the kennel? May be many people say,"I hope my Akita dog spends freely without confine in the narrow kennel". But the veteran owner of above-mentioned has the idea of ​​reverse. He said,"The Akita dog who spends wide space of outside in the day time is poor against joy when he or she goes to walk. Because the dog always moves around in the day time". On the other hand, the Akita dog who spends in the kennel swaggers strong just like representing the joy when he or she goes to walk. The veteran owner who experienced the judge in Akita dog's contest about 20 years also said, "The Akita dog who spends wide space of outside in the day time is poor sense of tension in Akita dog's contest. On the contrary, the Akita dog who spends in the kennel is made to exude strength in walking and runnig at a fixed time. I saw through the difference immediately". If the Akita dog's situation less than 5 months since birth is different. They need to walk and run at their own will in as far as possible in the wide space without towline. We can't explain you the reason. Because the veteran owner said,"It is the theory of mongaifushutsu =do not publish= ". But it will be extremely important for the future of the Akita dog. 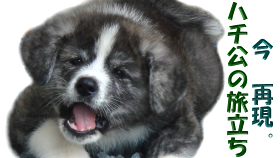 If you will not be able to secure wide space full-time for an Akita puppy, we recommend you the puppy can walk or run without towline at their own will even if only 5 minutes in per day. The Akita dog's owners who put the game to contests are big real thrill what they build up the valuable Akita dog over the life. And it will divide the victory or defeat how space to live the Akita dog. But if you are not interested in Akita dog's contest, living wide space or kennel in the day time isn't important. The most important thing for the owners is living together as a member of the family. It is the reference picture of Akita dog's kennel.